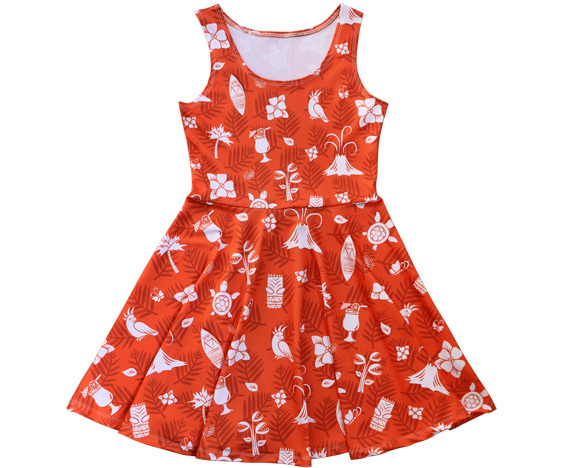 For years I always wanted a red surf dress with a Hawaiian hisbiscus flowers pattern but I could never find one in the shops. So now I’ve designed my own! 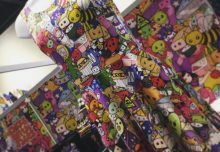 And I’ve added some kawaii into the mix to make a KAWAIIAN DRESS. UPDATE: Pre-orders have now closed. 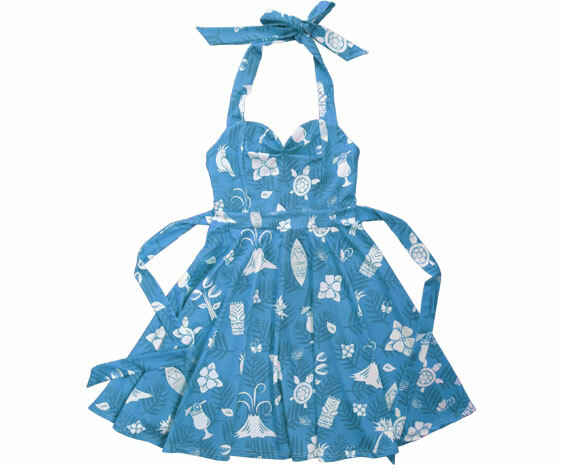 The most popular dress was the blue skater dress – it’s now on general release. Thank you to everyone who pre-ordered – you’re awesome! Guys – stay tuned – there’s something coming for you very soon! I’ve had lots of requests for more clothing for men and there is something on the way for you. 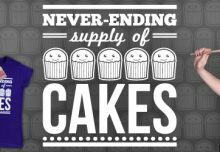 I don’t want Cakes with Faces to just have womens clothing, and mens clothes are so boring in the shops (more checks, anyone?) so I definitely want to design awesome stuff for you guys too. I’m currently waiting for a sample to arrive, so if it’s up to scratch I’ll have something for you soon! I started off with traditional Hawaiian hibiscus flowers, which I knew I wanted on my dress. 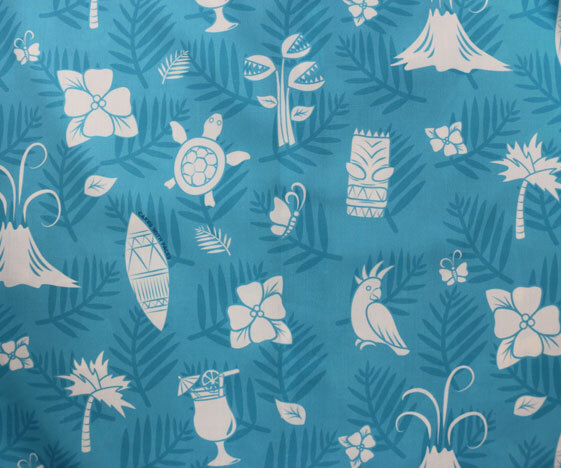 Then I opened it up and added more into the pattern – with tropical, Polynesian tiki party as the theme! 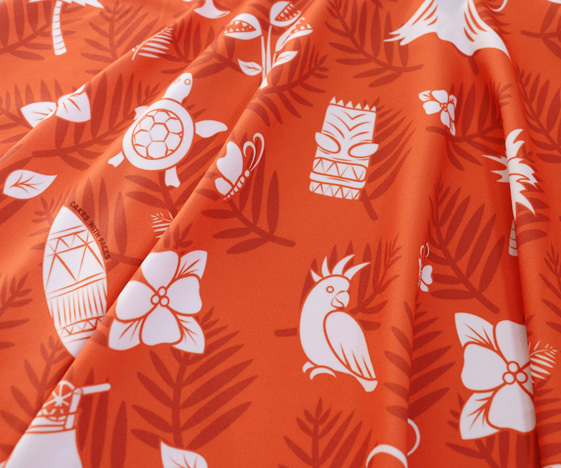 There are parakeets, butterflies, cute turtles, cocktails, surfboards, tiki masks and man-eating tropical plants for a Hawaiian pattern with a difference! 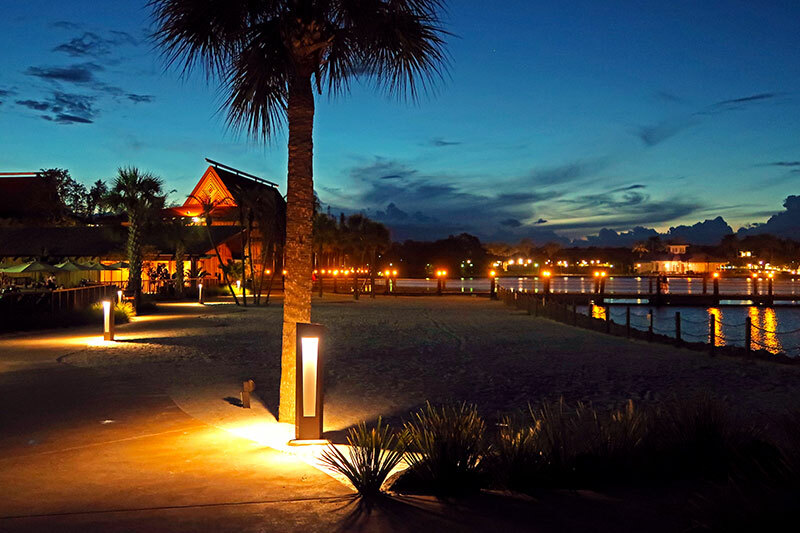 I love the tropical theme of the Polynesian Resort at Disney World. I was there last year – I had a dinner reservation at Kona Cafe and took a boat across the lake from the Magic Kingdom. 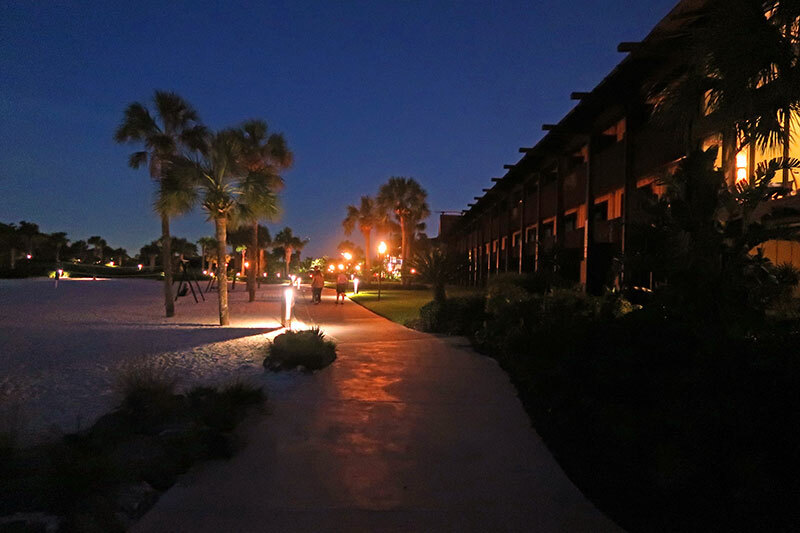 It was just so magical, strolling on the beach as it was getting dark, with all the palm trees and flaming torches. I love the theming of tiki bars with all the slightly-menacing fun masks and tropical style (wish I’d gone to Trader Sam’s now!). Why aren’t there more tiki bars? Pre-order now and you’ll be the first to have the new design. The dresses will be despatched as soon as they’re ready – estimated mid October 2018. You’ll receive an email when yours is on its way. Is it ridiculous to have a tropical beach-style dress in September/October when all the normal shops are full of coats and jumpers? Well we always like to be different, and here at Cakes with Faces summer never ends. 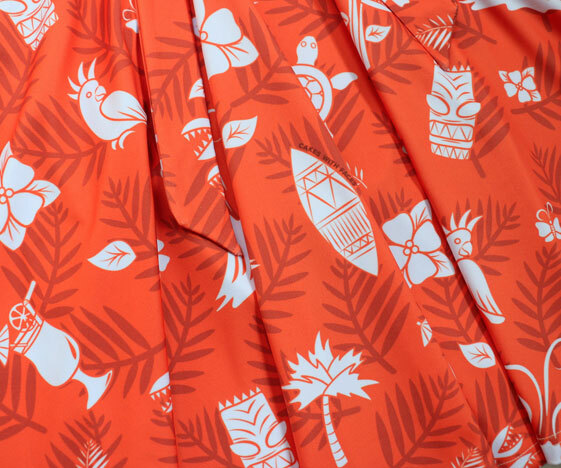 Be tropical all year round – rock the tiki party and shine like it’s 30 degrees and full sun. After the pre-order’s finished, only the most popular combination will be stocked in the shop. Which will it be?? I actually can’t pick a favourite! This also means that three of these dresses are pre-order exclusives. The skater dresses are the same style as Shark Attack and Cute Explosion – sleeveless skater dresses with full circle skirts. They’re fit and flare – fitted at the top and flaring out at the waist (which is fairly high, around the bottom of the ribs). They’re better quality than a lot of skater dresses and slightly longer. On me they’re just above knee length. They’re really comfy so they’re fine for casual wear or dress them up for going out. I wear them with a cardigan and over the knee socks in winter! The skater dresses are available in red/orange or Hawaiian blue – both are available during the pre-order only. They’re in sizes from UK size 6 to 20. They’re slightly on the small side, so if you’re in between sizes or large in the chest, I’d usually recommend getting the larger size (so regular/average size 10 should get 8-10, but if you’re a larger 10-12 or large in the chest, go for the size 12). The fabric is stretchy – and measurements are in the size guide. The cocktail dresses are a brand new style of dress for Cakes with Faces. These are a little fancier, and perfect for going out or parties when you want to dress up a little. The fabric is stretchy – very similar to the fabric of the other dresses, so they’re comfy to wear and don’t get creased. The style has a sweetheart neckline, with ties for a halterneck top. The back is rouched with elastic so there’s some flexibility in the sizing. There are also waist ties for a cute bow at the back. The skirt’s full – not a full circle but almost, so it’s nice and swishy, like a 50s style swing dress! They’d look good with a cardigan or shawl and heels (although to be honest I’ll definitely be wearing mine with my trusty Converse as always!). 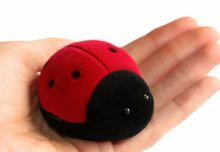 They’re also available in a choice of red/orange or Hawaiian blue during the pre-order. After the pre-order, only the most popular style and colour will be available. The sizing is similar to the other dresses, and they’re available in UK sizes 6 to 20 (measurements in the size guide). The new dresses are available to pre-order right now in the shop. 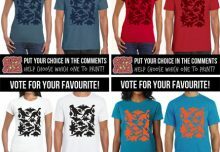 I hope you like the new design and I’d love to know what you think! Drop me a line on Facebook, Twitter or Instagram. And if you get one, I always love seeing your photos!